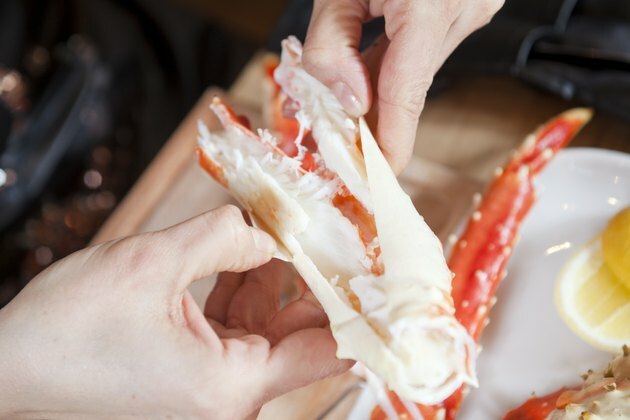 Cracking open the tough, outer shell of a king crab leg is enough to make your mouth water. Even though king crab legs are lean, full of nutrients and low in calories, they are full of sodium, which could be a concern, if your blood pressure is on the rise. Livestrong.com's calorie counter shows that you'll get around 130 calories from one king crab leg that weighs 134 grams, or about 5 ounces. Nearly 80 percent of the calories, or 105 calories, are from protein. King crab legs do not contain carbohydrates, so the remaining 20 percent of calories, or about 25 calories, are from fat. You'll get nearly 6.5 times your recommendation of vitamin B-12 from a single king crab leg. B-12 makes red blood cells and helps run your metabolism. That same king crab leg also has more than half of your phosphorus requirement for strong bones, as well as almost your entire daily need for zinc, a mineral that improves your immune health. Because crabs come from the sea, they spend their lives soaking in salt water, making king crab legs very high in sodium. The Dietary Guidelines for Americans 2010 recommends having no more than 2,300 milligrams of sodium daily, as long as you're generally healthy. You'll get more than 1,435 milligrams from just one king crab leg.